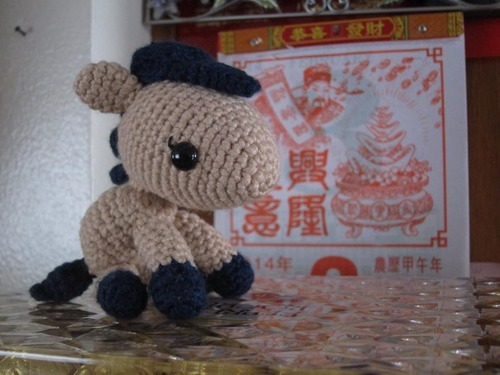 Kim-Hoa from California made this horse for her husband since he was born in the Year of the Horse! He chose out the colours himself and loved how he turned out. 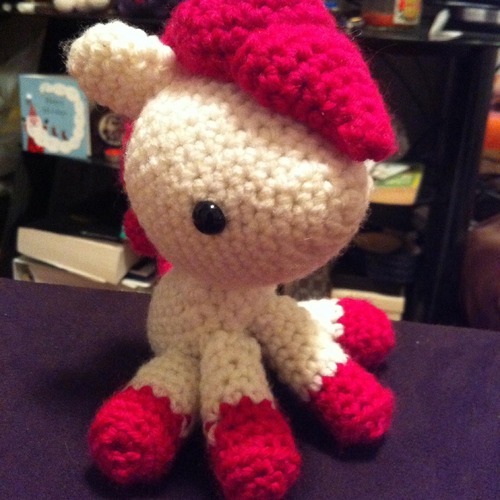 I think it’s incredibly sweet how Kim-Hoa made this adorable Pony for her husband! Ana of “Mis PequiCosas”, who is originally from Spain but is now living in Switzerland, made this gorgeous pony using fine yarn. She named him “Johnny” and blogged about him HERE. She says that he is indeed a baby pony because he is just learning how to stand on his 4 legs! 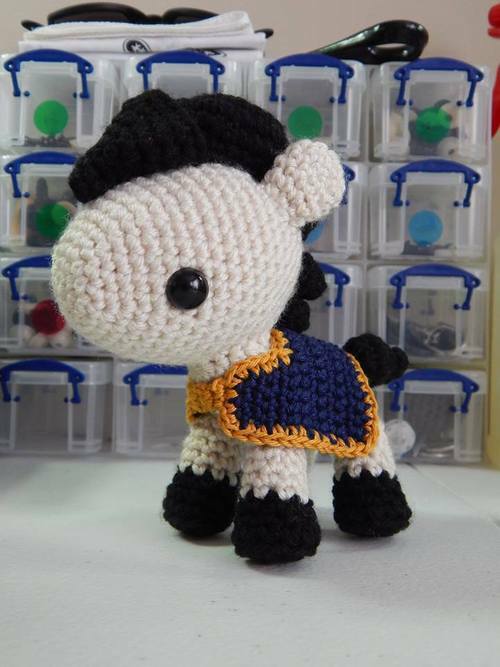 Ana writes that it was a challenge using fine yarn but that she is very happy with how he turned out 🙂 I think her work looks impeccable as always! Amanda of “Crystal Panda” from California has three friends who are having their first babies this year during the “Year of the Horse”! 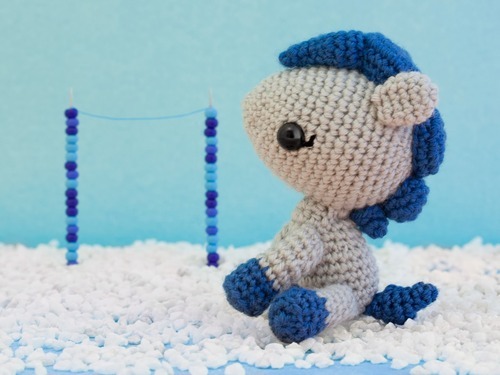 She made this pony below for the first horse baby and even personalized it with her info including her name, date of birthday and birth weight! How incredibly meaningful and special! You can read Amanda’s blog post about her pony HERE. 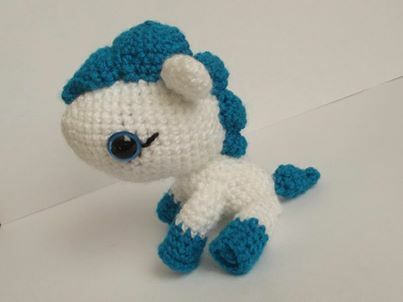 Ania of “Szydetkowe AnWool” from Poland made a blue and white pony with big blue eyes! She blogged about her version HERE. I’ve really enjoyed seeing the different colour combinations that people have used! 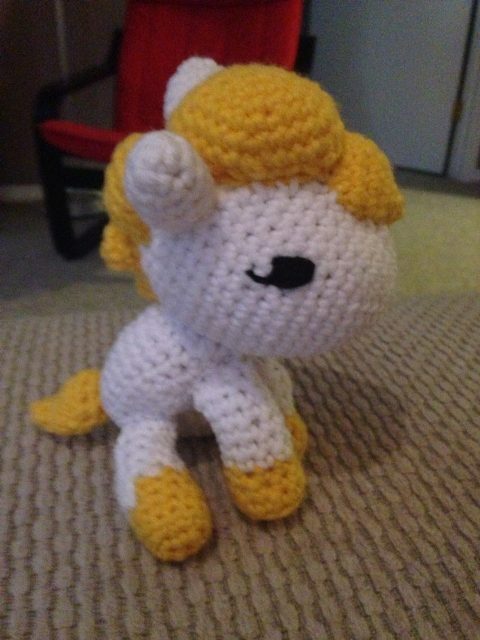 Jenna from Saskatchewan, Canada made this golden-maned pony for her sweet little girl who declared, “It’s for me!” as soon as she saw it 🙂 Jenna and I were actually grad school classmates, and it’s sooo neat whenever I see someone I know personally crocheting and following one of my patterns! 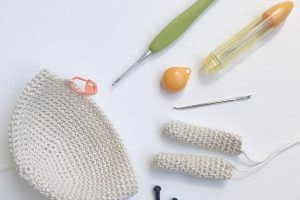 Jenna actually started crocheting when she was very young at the age of 6, but she took a big break and picked it up again a couple of years ago. I am so glad that we both rediscovered our love of crochet! Jenni decided to make this pretty pony for herself after having made so many toys for other people! Love her purple mane and double lashes! Roseanne from Uruguay made this little beauty for her 11 year old daughter who was born in the Year of the Horse! Roseanne said that she really enjoyed making this pony and that both her and daughter fell in love with it! 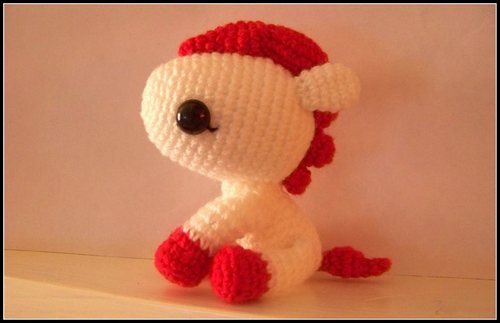 Teresa from Canada also decided to use red and white for her very first horse and had a lot of fun making this cutie! I’ve loved seeing how you all put together the mane for your horses, and this one looks particularly spunky and mohawk-like! 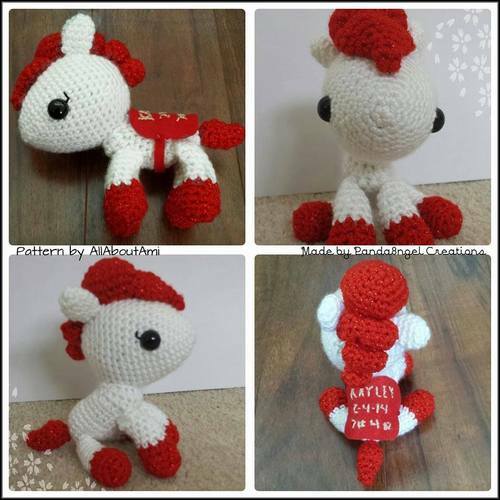 Trish from California is rounding out the red and white ponies with this little horse that she made for herself! Her daughter is jealous as she wants one too, and Trish writes that she needs to get a shelf in her kitchen to display all her little stuffies! 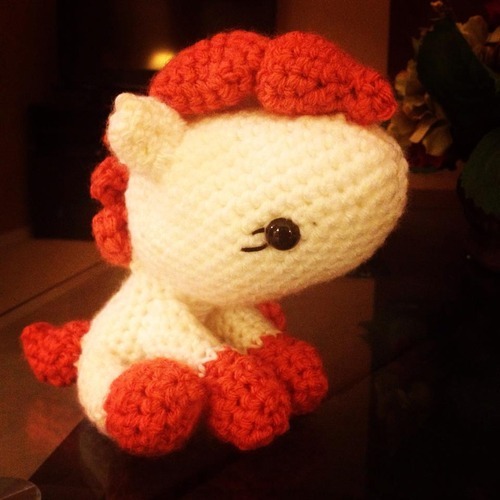 Jenny from Wisconsin just learned how to crochet a couple months ago and has already made many amigurumi using my patterns such as Dragon and Snake! 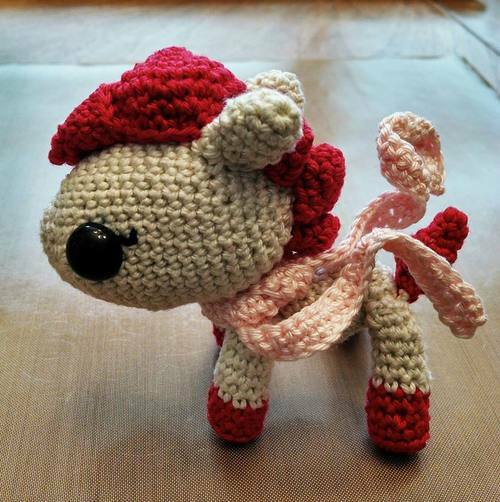 She made this absolutely beautiful pony as a gift for her husband for Valentine’s Day. I adore the lustrous yarn she used as well as the swirly scarf accessory that looks like it’s blowing in the wind! Makayla of Planet Yarn from Illinois also made an exquisite accessory for her beautiful pony! She crocheted this blanket and posted the pattern on her blog HERE so you can make one for yours too! I’ve absolutely loved seeing all your ponies and these are only a dozen of them as I didn’t want to cram too many into one post! 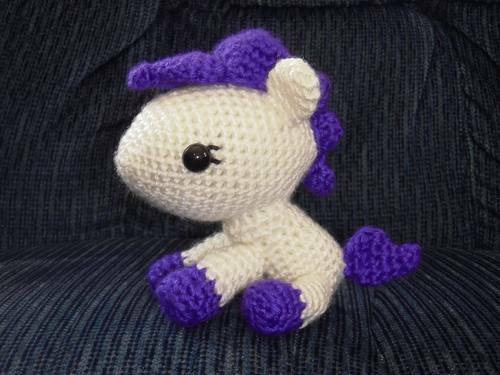 And so, if you didn’t see your pony in this post, do not fret as I am already compiling pictures for the second Crochet Corner post featuring Pony! 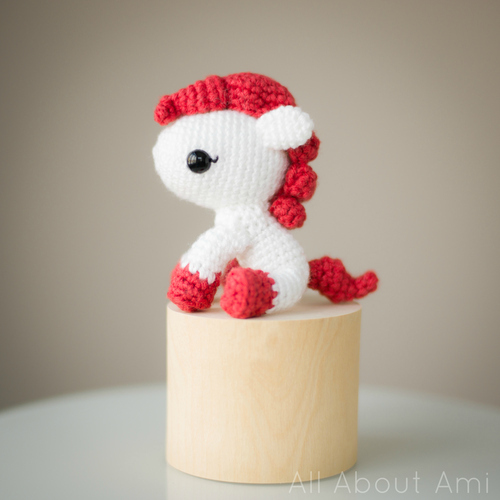 Hope you feel inspired to create your own Pony after seeing these pics- the free pattern can be found HERE and the step-by-step blog post can be found HERE. Thank you for bringing our pony pattern to life with all your beautiful renditions! 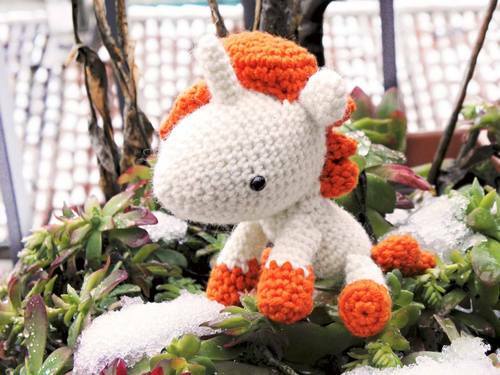 To check out more “Crochet Corner” posts, visit this page HERE!